Our hearts are completely broken. The greatest man I ever knew, died on the afternoon of Saturday, May 14th doing what he loved. He was in a plane crash while crop-dusting in West,TX. He was 75 years old. I want to write a few lines of thanks to my daughter, Fawn, for creating this website for me, and I hope all that would like to add stories, ideas or photos to it, to let us know. I don't really consider myself in the music business any longer, although I guess I am in the selling of my music. I don't hit the road doing shows anymore. I do get the guitar and fiddle out now and then for my friends if they ask, and do enjoy it. There's even a new CD in the works. So I guess I am in "Showbiz". I am honored that my daughter Fawn thinks of me as a "great man", but I'm just a man who has enjoyed life and made many mistakes, maybe more than most men. I was a little wild as a young man, but there are not many things I'd change if I could live this life again. What ever new adventure of life I was into, I gave 110 percent, until I moved on to the next period. I believe the only thing I never tired of is flying. I look forward to each day's work as a crop duster pilot, which is what I've been doing for the last 30 plus years. I think my music career has always been sidelined if it got in the way of my other interest. One of the things I hated about my early years in music was having so many others making decisions for me... like changing the spelling of my name to Sea, it's spelled SEAY and I changed it back as soon as I had a chance. I never liked having others being in control of what songs I'd record, or what photo to use, etc. In the music business, too many others are in control of what makes it to a listener's ear. Music is a lot more fun when you're not doing it for pay. I was only seventeen years old when I recorded my first record in 1958 and had just turned eighteen when I joined the "Louisiana Hayride". I stayed in Shreveport, LA until 1960 when I moved to Nashville. I recorded for six major labels, had many hits and was a "Grammy" nominee, but still I was unhappy with the business at the end of my music career. In 1969 I decided to leave Nashville to pursue a few of my other dreams. I was still young enough, and had the drive to ride over that next hill and see what was on the other side. I've done everything I dreamed of doing as a kid. I was a cowboy, a horse wrangler, I'm a rancher, I'm a locomotive engineer, I worked for the Santa Fe Railroad, the Fort Worth and Western Railroad and the New Orleans & Gulf Cost RR. I've run both steam and diesel locomotives. 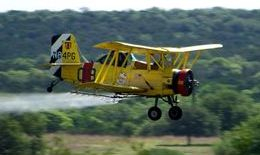 I've been flying crop duster aircraft as a crop duster pilot for more than 30 years, with more than 18,000 hours flying time. I have nine children and fourteen grandchildren and still write a song now and then. All my life I've been interested in art. My mother is a great painter, my sister Jo Ann is also a very talented painter, so I guess it's in my blood. I've worked in oil, pastel, pin and ink and watercolor. I've done some sculpture and in 1977 started the long learning process of becoming an engraver of firearms in the old way, with hammer and chisel. When I left Nashville, I didn't look back. I had a couple of releases in 1970-71, but I was cowboying on the Miller Ranch at Justiceburg, Texas for Riley Clyde Miller on a really big West Texas Ranch, and at that time I was trying not to think of the music business. For over three decades I intently kept away from show business. I didn't want to be found, I worked sometimes for months or years with people who had no idea I had ever been a recording artist, because I didn't want to explain why I wouldn't do "Showbiz" anymore. Most people think your nuts to leave that life. Well, I've mellowed over the years and I'm now happy with my memories... I hope to write a book on my life and have started it, mostly as a legacy for my children and grandchildren with hope that others will enjoy it too. So, please enjoy what my daughter Fawn Raven has done with this "Johnny Seay" website and let me hear from you from time to time.